Who is this for? Miss Claire Lip Balm Red Velvet is For those looking for a moisturizing lip balm that is buildable and light on the pocket. In terms of the packaging, it’s nice and simple. The center of the tube is red with black on either side. It has the shade and ingredients mentioned in it. So when I saw this online and made the purchase, I expected it to be like any other balm with a basic gloss finish. 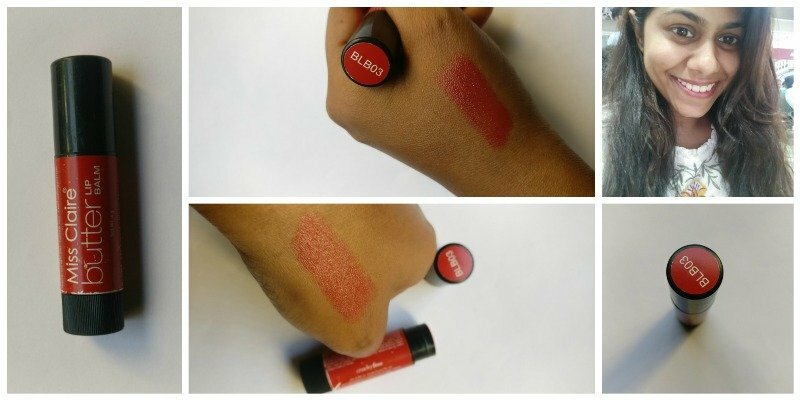 But this one actually adds color to your lips and can be super buildable. It glides on very smoothly and does feel like butter. I think this is super reasonable. It’s barely INR 150 and does a good job. It does a good job in this department too. I don’t touch up too often. No complaints as of yet. For sure. I’m very happy with the results and would love to try the other shades too.